Four retailers, anchored by Tucson’s first 50,000-square-foot Hobby Lobby, will move onto the 7.4-acre former Mervyn’s department store site at the northeast corner of East Broadway and Craycroft Road. The building, at 5545 E. Broadway, has been vacant since the Mervyn’s chain liquidated and closed at the end of 2008. The store’s empty 81,000-square-foot shell will be subdivided and redeveloped. Hobby Lobby, a national arts and crafts retailer, will share the building with Stein Mart, which has leased the remaining space of about 30,000 square feet. Also on the site, a former tire store that has been vacant for about 20 years will be razed and replaced with a new 14,500-square-foot, multi-tenant retail pad that will house a 3,250 square-foot Mattress Firm store and a 3,200 square-foot Vitamin Shoppe. Additional limited space is still available for lease on the new pad. Property owner Benenson Capital Partners, New York, announced the leases May 15. Hobby Lobby expects to occupy its space by the end of the year. This is the company’s first store in the Tucson market. Stein Mart is a national retailer known for selling off-price, high-end merchandise. 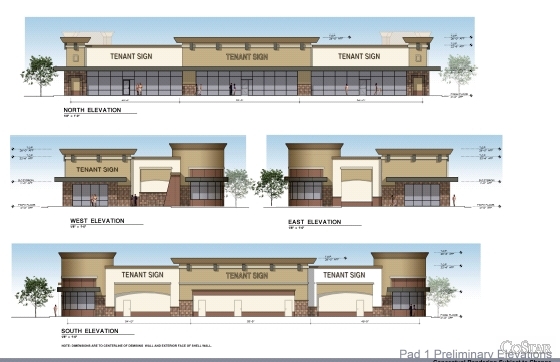 It has one store already in the Tucson market, at 4881 N. Stone Ave. Nancy McClure, vice president with CBRE, said she anticipates the second store will be open in time for the holiday shopping season. On the multi-tenant corner pad, Mattress Firm plans to open in early 2013 and the Vitamin Shoppe’s opening has yet to be determined. Houston-based Mattress Firm entered the Tucson market in 2010 and is up to five locations. This will be Vitamin Shoppe’s first store in the market. The New Jersey-based chain has 528 stores nationwide including one each in Mesa and Chandler. Benenson Capital is one of the nation’s oldest privately held real estate investment and development companies. CBRE’s McClure represented the firm’s East Broadway Tucson Co. LLC in negotiating the four lease agreements. W.E. O’Neil Construction Company, 710 S. Campbell Ave., is the general contractor. Hershman Architects, 2210 E. Fort Lowell Road, is the architect. McClure said all the architectural drawings have been completed and the contractor hopes to begin pulling building permits from the city this week. The site on the high-traffic intersection drew attention from interested retailers and developers almost from the time the Mervyn’s store closed. Strategically located between Park Place and El Con malls, more than 90,000 cars pass through the intersection each day. Plans call for redevelopment of the entire property. The building’s exterior façade has been redesigned and a demising wall added to split the space. San Francisco-based Mervyns LLC had sought to save itself through a Chapter 11 bankruptcy reorganization in 2008 but was unable to put together a financial recovery plan. The chain was liquidated and all 175 stores in seven states were closed by the end of the year. Contact reporter Roger Yohem at [email protected] or (520) 295-4254. Editor’s Note: For quarterly reports on the Tucson retail market and other sectors, click here.